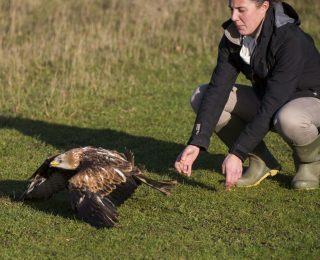 Opened by the Duke of Gloucester after a three-year fundraising appeal, the Hawk Conservancy Trust’s National Bird of Prey Hospital™ can receive and treat more than 200 sick, injured or orphaned birds of prey each year. As well as receiving injured birds from the public, our specialist, state-of-the-art facilities mean we’re able to take in birds of prey from other wildlife centres too. Our National Bird of Prey Hospital™ contains a treatment room, nursing bays and a state-of-the-art Rehabilitation Aviary Wing. This wing plays a key part in giving recovering birds the best chance to regain their fitness before we release them back into the wild. Our hospital also acts as the base for our research projects that benefit wild, injured and rehabilitated birds. 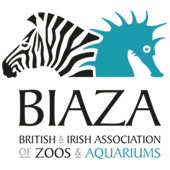 We also have incubation facilities which support captive breeding programmes. Our hospital is also a training facility for organisations such as the RSPCA and the Royal Veterinary College as well as colleges and universities. When an injured bird is admitted to the hospital, our team will assess the bird to see if it needs to be seen by our designated veterinarian, John Chitty. John is an expert avian veterinarian and has worked with us since the early 1990s. 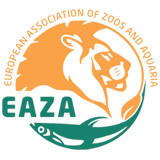 He has been Chairman of the European Association of Avian Veterinarians and also President of the British Small Animal Veterinary Association in April 2017. 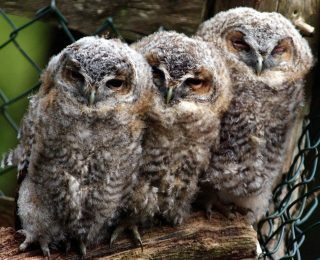 During the spring and summer, there are often many Tawny Owls in our hospital. If you see a Tawny Owl that’s obviously injured, then please call us or bring it to us. However, if you see a chick on the ground, it may not necessarily be in need of assistance. It’s quite common for young chicks to fledge before they’re able to fly well enough to return to the nest. This means that although one might be found on the ground underneath, in the majority of cases its parents will continue to care for it. We recommend that if you do come across a Tawny Owl chick on the ground then either leave it where it is or, if it’s obviously in danger such as near a road or path, return it to the nest if you can see it or place it safely on a branch (or similar) nearby. If you’re ever in doubt, don’t hesitate to give us a call on 01264 773850 for advice. 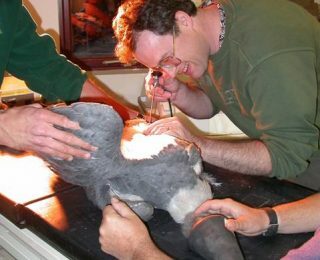 Below are a list of research projects undertaken through our work in the National Bird of Prey Hospital™. The goal of these projects is to achieve the optimum welfare outcome for all admitted birds and reduce risks in the wild. Where do birds of prey get injured? Project aim: To understand the spatial and temporal distribution of factors leading to raptors being injured or killed and identify methods of reducing these mortality factors. The National Bird of Prey Hospital™ can receive over 200 admissions each year and its extensive database goes back over 20 years. 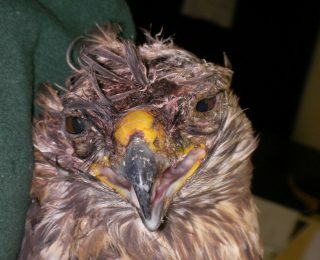 The causes of raptors being admitted are varied but fall into several broad categories and for each admission, the location of where the bird was found is recorded. This project uses the long-term data set from hospital admissions to investigate patterns across the landscape of where birds of prey get injured and what type of injuries they experience. Areas of high risk for raptors can be identified and, hopefully, rectified. What happens to birds after they've been to the hospital? Project aim: To assess the efficacy of veterinary and rehabilitation treatment methods by monitoring the survival of rehabilitated raptors once released back to the wild. Measure and assess site fidelity. The National Bird of Prey Hospital™ admits approximately 200 birds each year. After receiving suitable veterinary treatment and undergoing rehabilitation many of these birds are released back to the wild. A proportion of all birds released from the hospital are fitted with radio-transmitters and their movements are tracked for several months. This enables the determination of key indicators of rehabilitation success such as post-release survival and provides a means of improving our understanding of the post-release behaviour and landscape-use of rehabilitated birds. 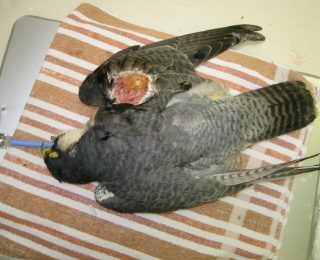 This information can also help in the development of new approaches to the treatment of sick and injured birds. 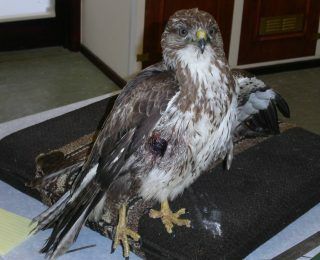 Is lead a problem for birds of prey? 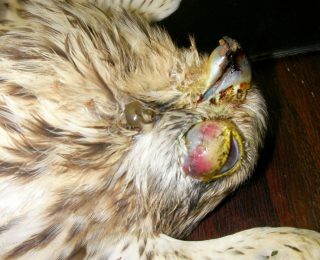 Project aim: To measure the incidence of lead in bird of prey hospital admissions, investigate modes of exposure in wild raptors and identify methods of alleviating exposure. Lead is a toxic element that occurs in the environment and has been phased-out of petrol, paint and plumbing. Lead is also used in ammunition for firearms and many hundreds of tonnes are released to the environment each year during shooting sports. Birds of prey and other species, such as waterfowl, are exposed to these lead residues and in some cases this exposure causes lead toxicity. Very little is known about the amount of lead to which raptors are exposed and this project uses a range of data, from hospital admissions to feathers collected at nests, to assess this level of exposure. Almost every bird that is admitted to the National Bird of Prey Hospital™ at the Trust has some degree of infestation by parasites – either internal (e.g. worms) or external (e.g. lice). That most birds carry parasites is a fact of life, but sometimes the condition and health of a bird can be compromised by a heavy infestation of parasites. In some cases, this will lead to the bird becoming susceptible to other injures. The project aims to untangle the relationship between a bird that is injured and has attracted more parasites or a bird that became injured as a result of having excess parasites. Support wild birds of prey through our work in the National Bird of Prey Hospital™. From just £3 a month you can make a real difference.